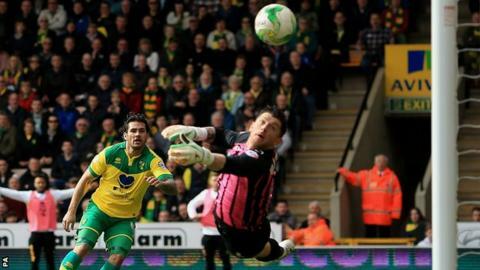 Bradley Johnson scored twice as Norwich moved up to second in the Championship with victory over Sheffield Wednesday. Johnson nodded in from Steven Whittaker's cross in the first half as the hosts dominated possession. The midfielder struck again just before the break when the Owls failed to clear a corner. The win moves the Canaries above Watford on goal difference, and they sit just a point behind league leaders Bournemouth. The hosts had the first chance of the game when Whittaker's deflected shot went just wide, and Alex Tetty's long-range effort forced the first save by Keiren Westwood low down. Norwich have won 10 of their last 14 games, drawing three and losing one. Johnson rewarded Norwich's early pressure when he did well to generate power in his header from a floated Whittaker cross. After Caolan Lavery headed wide for the visitors, Norwich midfielder Jonny Howson fired wide while Graham Dorrans's left-footed strike was well saved by Westwood. Following a jinking run from Wes Hoolahan which resulted in a corner, Johnson grabbed his second from Cameron Jerome's flick-on with a smart shot from close range - his third goal of the bank holiday weekend. Despite his two goals, Johnson was later handed a yellow card after coming on to the pitch without the referee's consent following some treatment for a head injury, and he will miss Norwich's next two games as he has picked up his 10th caution this season. Wednesday, who were unbeaten in their last 10 meetings with Norwich, struggled to create meaningful opportunities throughout but remain safe in the table, in 12th position. "I thought we played really well in the first half and had two goals to show for it. "In the second we didn't move the ball as quickly as I would have liked at times but we did a good professional job in seeing the game out and I never felt we were in danger of losing control. "I don't know how important it is to be in the top two with five games still to be played, but the good thing is we now have points in hand on those teams below us and if we keep winning we will stay in the top two. We just need to focus on winning our games, starting with the next one at Bolton." "We contributed to our own downfall with some poor defending for their two goals. For the first one we should have got the ball away long before it came into our box and for the second we switched off at a corner after dealing with them well before that. "We have got 16 clean sheets so we have generally defended well this season, but not today. "I also felt Norwich had an advantage by having an extra day's rest when we had to play on Saturday. It would be fairer if we all played on the same day. Now we have got to make sure our season doesn't fizzle out." Match ends, Norwich City 2, Sheffield Wednesday 0. Second Half ends, Norwich City 2, Sheffield Wednesday 0. Corner, Norwich City. Conceded by Tom Lees. Attempt blocked. Martin Olsson (Norwich City) left footed shot from a difficult angle on the left is blocked. Assisted by Vadis Odjidja-Ofoe. Substitution, Norwich City. Vadis Odjidja-Ofoe replaces Bradley Johnson. Attempt blocked. Cameron Jerome (Norwich City) right footed shot from outside the box is blocked. Assisted by Martin Olsson. Attempt missed. Cameron Jerome (Norwich City) header from very close range misses to the right. Assisted by Nathan Redmond with a cross. Substitution, Norwich City. Gary Hooper replaces Graham Dorrans. Corner, Norwich City. Conceded by Kieran Lee. Attempt missed. Nathan Redmond (Norwich City) right footed shot from the right side of the box misses to the left. Assisted by Jonny Howson. Claude Dielna went off injured after Sheffield Wednesday had used all subs. Attempt missed. Jonny Howson (Norwich City) right footed shot from outside the box is too high. Assisted by Graham Dorrans. Substitution, Sheffield Wednesday. Sergiu Bus replaces Caolan Lavery. Offside, Sheffield Wednesday. Lewis Buxton tries a through ball, but Filipe Melo is caught offside. Bradley Johnson (Norwich City) wins a free kick in the defensive half. Corner, Norwich City. Conceded by Claude Dielna. Attempt missed. Kieran Lee (Sheffield Wednesday) right footed shot from outside the box misses to the left. Assisted by Atdhe Nuhiu with a headed pass. Offside, Norwich City. Graham Dorrans tries a through ball, but Bradley Johnson is caught offside. Attempt missed. Sebastien Bassong (Norwich City) header from very close range misses to the left. Assisted by Wes Hoolahan with a cross following a corner. Corner, Norwich City. Conceded by Atdhe Nuhiu. Attempt blocked. Bradley Johnson (Norwich City) left footed shot from outside the box is blocked. Assisted by Alexander Tettey. Bradley Johnson (Norwich City) is shown the yellow card.